If you want a special place for your four-legged friend, you don’t have to look much further than your garage or local yard sale. 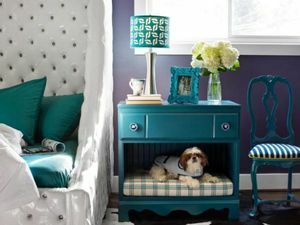 With a little elbow grease and a creative eye, you can repurpose some common household items into a new bed or dog crate. Below are some ideas to get you started! Has your child outgrown their crib? Give it new life as your four-legged friend’s new home. 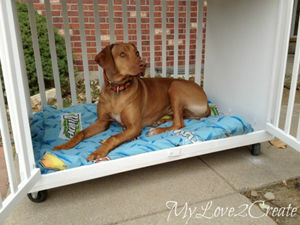 Mindi at My Love 2 Create (guest post on My Repurposed Life) converted an old crib into a new dog crate. As long as your dog doesn’t chew through wood, this is a great idea for replacing a coated metal cage with something more stylish. You can customize it to fit in with your current home décor and put a solid top on it for use as a table or storage for dog treats. What can you find at most garage sales and thrift stores? Old side tables, and they make the perfect beds for small dogs. Livvy at 86 Lemons took a side table that looked to be from the ‘70s and converted it to a dog bed with a fresh paint job, cushion, and all. If your pup gets into things when you’re out of the house, we’ve also seen side tables with added crate doors. Your options just depend on the size of the table and your dog. Here’s another project similar to the side table, but this one is created from a small flea market dresser. Brian Flynn on the DIY Network removed some drawers, added beadboard, sanded down the rough spots, and gave it a nice coat of paint. Finally, he added a thick cushion for the pup to lie on. 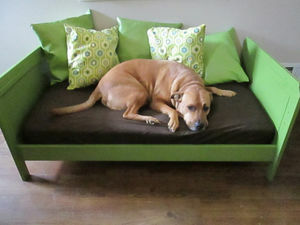 The result is a charming dog bed that blends in with the current style of the bedroom. Are you lucky enough to have a spare corner in your home? 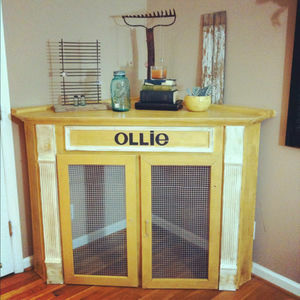 Janelle at Simple Janelle Designs bought a corner mantel at a garage sale for $5 and converted it into a dog crate for her living room. Her husband built some custom doors. Then, she gave it a fresh coat of chalk paint, distressed it, and applied a coat of wax. The underside is her dog’s home and the top is used for displaying treasures. Have an old tire lying around that you don’t know what to do with? Make it into a dog bed! 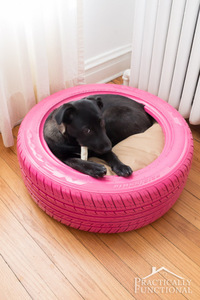 Jessi at Practically Functional shows how some soap, water, paint, and felt can make a tire the perfect bed for a dog that loves to curl up. Of course, you could also make it for your cat, but I think we all know how that would work out. Old suitcases have a wonderful charm about them and some DIYers have done a great job repurposing them into shelves, chairs, tables, and…dog beds! 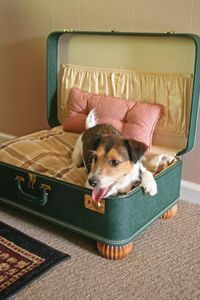 Karen at Capper’s Farm explains how to convert a vintage suitcase into a raised dog bed with the simple addition of pre-fabricated legs and a pillow. This is a fun bed for smaller dogs. Many of the beds shared so far are for smaller dogs, but there are many options for larger breeds. 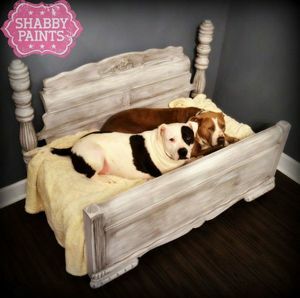 Shabby Paints shared how to build a dog bed from a recycled headboard and footboard. It requires construction of the base of the bed, but it’s a simple 2’ x 4’ rectangle and the mattress is a water and dirt-resistant toddler mattress. What could be a simpler conversion than from a toddler bed to a dog bed? Seriously, all it takes is some paint, a fitting mattress, and a matching crib sheet. Jaime from Thrift Aesthetic shares exactly how to do this. Of course, the heated blanket is optional…if you can live with the guilt of what could have been every time you look at that face. If you’ve ever glanced at Pinterest, you would know that there are mountains of ideas for furniture and home décor made from wood pallets. Dog beds are no exceptions. There are a lot of great design ideas from deep beds on brass pipes to double deckers with chairs; however, not many will explain how they’re made. 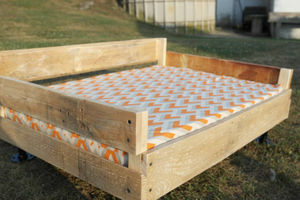 Meagan at The Charming Farmer has put together a nice tutorial on how to assemble this simple pallet dog bed on pipes. If you want to make the bed easier to move, you can replace the pipes with casters. 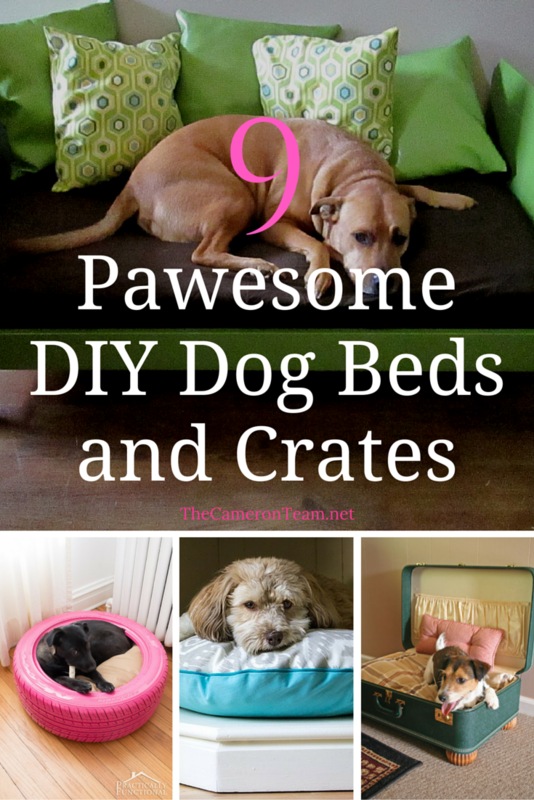 Have you seen a great DIY dog bed tutorial? Share it in the comments!